After reading about the 1,000-car rattlesnake-infested junkyard in Texas last week, a Jalopnik reader decided to survey the scene. Google's satellites were right: What Detroit makes, the earth takes. 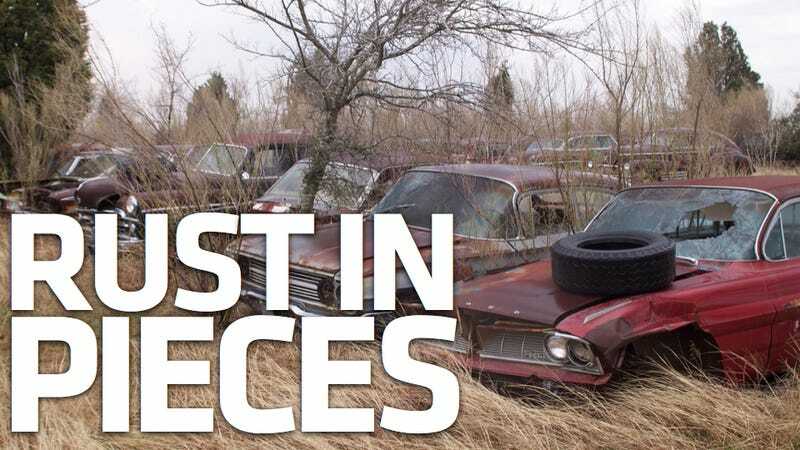 Here's a look inside a huge rotting classic car graveyard. Given Texan propensity for strict interpretation of trespassing laws and enthusiastic firearm possession, we wouldn't recommend such a visit without clearance, but reader Kevin Miller knew the terrain. What he found following the Google map: an abundance of American cars and trucks mostly from the '50s through early '70s, apparently untouched for years if not decades, most more rust than steel. Many of the cars and trucks have been turned into tree planters and wildlife refuges, but a surprising number fall into that nether region of decay where a crazed restorer who enjoys turning money into Bondo could recreate their dream car. Last we heard, what with scrap metal prices rising again, this herd is still heading for the great crusher in the sky. And we still don't yet kno who owns the property or what they plan on doing with these remains. Any other sleuths out there want to help us out? You can see more of Kevin's shots by perusing the gallery above, or through his Flickr page.